As Atlanta Hawks point guard Kirk Hinrich went up on a drive to the basket in the fourth quarter of his team’s series-clinching win over the Orlando Magic last week, he felt a pop and swelling near his knee quickly followed. His initial concern was that it could be a knee injury. Fortunately for Hinrich, it was only a right hamstring strain; however, it will likely hold him out at least the first few games of Atlanta’s Eastern Conference Semifinals matchup with the Chicago Bulls. Prior to the Hawks’ shootaround at the United Center Monday morning, Hinrich confirmed he would miss Game 1. Regarded as one of the top defensive guards in the league, Hinrich’s absence is a blow to the Hawks, who will start Jeff Teague in his place. And while the outlook for Hinrich isn’t great, he’s optimistic he could play should the series last six or seven games. “I’m definitely still holding on to hope,” said Hinrich of a return. 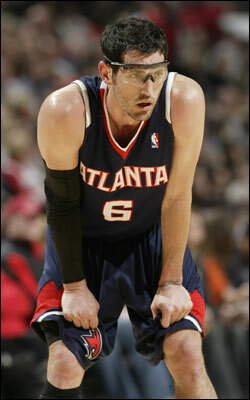 In the meantime, Hinrich and the Hawks have confidence in the 22-year old point guard who will take his place. “Jeff can really play; it’s just a matter of him getting an opportunity,” said Hinrich of Teague, who played only twice for a combined 10 minutes of action versus Orlando in the first round. Teague, 6-2 and 180 pounds, started seven times during the regular season, averaging 8.4 points, 3.3 assists, 2.7 rebounds and 1.7 steals in 26.1 minutes per game. Drew added that Teague would start on likely NBA MVP Derrick Rose defensively. Though he struggled with his shot in Chicago’s two games in Indiana, Rose appeared to return to form in Game 5 and averaged 27.6 points, 6.2 assists, 4.6 rebounds and 2.6 steals per game. Drew is quick to acknowledge that Teague and the Hawks have their work cut out for them. Though they lost their final six games of the regular season, the fifth-seeded Atlanta Hawks figured things out in time for their series against the fourth-seeded Orlando Magic, winning their first round series 4-2. Hawks guard Jamal Crawford believes they may be peaking at the right time. Due to increased gate security at tonight’s game, and at all future Playoff games, the Bulls are encouraging fans to arrive early. Gates to the United Center open tonight at 5:30 p.m. Game time is 7:00 p.m. For the latest Playoff schedule, visit Bulls.com/Playoffs.